It's Christmas 1932, and the Wortham and Hammond families are still grieving the loss of dear family members just one year earlier. The Wortham children have come down with a mysterious illness, and it looks like Christmas will be miserable, until the children's homemade Nativity scene takes on a life of its own. 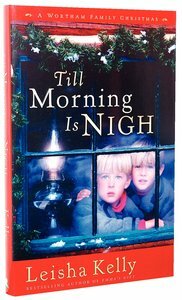 About "Till Morning is Nigh"
It is December of 1932, just one year after the Worthams and the Hammonds lost Wilametta Hammond and Emma Graham in one terrible night. The Christmas spirit seems largely absent again this year. George Hammond has disappeared, and Julia Wortham?? 's house is filled to overflowing with the Hammond children, several of whom are coming down with a mysterious illness. As Christmas nears, the children?? 's homemade nativity scene takes on a life of its own, bringing comfort in the midst of uncertainty and hard times. This heartfelt novella lets readers share Christmas with the Worthams and the Hammonds and discover the strength of faith, love, and family. "Wearily, I went on to bed, glad for the opportunity to rest my head on the soft pillow, even though the bed itself wasn't such a comfort with the mattress pulled off andlying in the next room. But tonight I knew I was too tired to care much about that. I figured I'd be asleep almost instantly. But my foot sliding beneath the sheets seemed to find something that didn't belong. Reaching down with one hand I found what felt like a roll of paper. Thankfully, Samuel hadn't blown out the candle yet, or I might have crumpled it without thinking. In the dim light, I could see what it was. Franky's little paper baby Jesus. How he'd gotten in our bed, I might never know." Leisha Kelly is the author of several popular historical fiction books, including Julia's Hope, Emma's Gift, and Till Morning Is Nigh. She has served many years on her local library board, continuing to bring good reads and educational opportunities to her community. Once a waitress, cafe manager, tutor, and EMT, Leisha is now a busy novelist and speaker who is active in the ministries of her church. She lives with her family in Clayton, Illinois.